Which of the following is NOT a category of transformers? Here are four transformers and four categories. Match the transformer to the correct category. Did you look through the transformer gallery to find these? The quicker way is to look at the help page for the transformer. While we are on the subject, transformers can belong to more than one category (though not all do). The key is to notice that the header of this dialog says "String Editor". 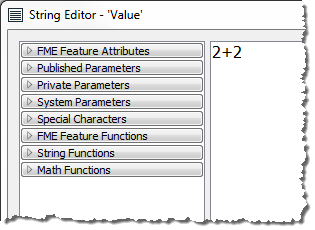 Therefore the value returned to this attribute will be the literal string "2+2". If the user wishes to add 2+2 to get 4, they should have used the arithmetic editor! How many of the transformers in the Filter category appear in the top-25 Most-Valuable Transformers list? So... why the Tester? Why not use the AttributeFilter? Because we only need to test for one value in a simple Yes/No format. The AttributeFilter is better for testing multiple values. Also the AttributeFilter doesn&apos;t let us do "Begins With" tests. It&apos;s impossible to tell from the screenshot, because you don&apos;t know how many attribute values will be a match. Because there are eight firehalls it will be anywhere from zero to eight, but that&apos;s all we can tell. Why do we use the StringCaseChanger on the roads data (to change it to UPPERCASE) rather than on the crime data (to change it to TitleCase)? Because uppercase is easier to match and has no risk of bad data. If a block was wrongly labelled W Georgia ST in the original data, a title case match would fail. An uppercase conversion would not. Also, be sure not to confuse the StringCaseChanger (changes attribute values) with the BulkAttributeRenamer (changes attribute names)!